The nautically themed Baranof is 100 percent Old Seattle. It gets the basic eggs-hashbrowns-toast trio just right. Thanks to years living in Portland on a journalist’s salary and a longstanding passion for the most important meal of the day, I have a deep, abiding appreciation for cheap breakfasts in diners or dive bars. But when I moved back to Seattle, I was devastated to find more Fancy Diner Concepts™ than the no-frills cheapskate-friendly alternative I’d come to rely on. If you’re in the same boat, I have good news: You can join me for breakfast on the Good Ship Baranof. That’s right! The Greenwood dive is good for more than $2 Jell-O shots and wonderful karaoke. It serves breakfast that’s diner-quality serviceable, plenty filling and — wait for it — cheap. I went the week before Christmas, and the convergence of holiday cheer and divey grime was really something. I mean this as high praise. From the mismatched holiday mugs on every table (mine featured festive penguins) to the 1950s-style silvery white Christmas tree in the window next to a mural of Orcas, the vibe was welcoming and weird. It was a powerful antidote to the uniform new builds (and empty lots waiting to become uniform new builds) down the street. If you’ve been by night to drunkenly bungle the lyrics to “Like a Prayer” (I’ve NEVER done this), the Baranof’s nautical theme isn’t new information. But it is more visible in daylight, and from the pale turquoise walls to the popcorn ceiling to the paintings of ships and light fixtures shaped like little glass-and-rope buoys, it is 100 percent pure, unadulterated Old Seattle. If you grew up here and somehow have never visited, I promise you’ll like it instantly. It feels like walking into the home of the eccentric aunt you didn’t know you had. Coffee snobs should go elsewhere, but if you’re a holistic caffeine fiend (like me) who can appreciate the full spectrum of coffee from Dunkin to Heart, who understands that Dutch Brothers AND Herkimer have their place, to everything there is a season, etc., you’ll like the Baranof’s coffee. Pours are generous, refills frequent, and the flavor is warming and appropriately burned, in a way that’s comforting, not gross. My favorite diner breakfast is a basic eggs-hashbrowns-toast trio. It’s usually the cheapest thing on any breakfast menu worth its salt, and for $6.99, the Baranof provides. The eggs and toast are just what they should be (the jam packets are strawberry! ), and the hash browns are giant, slablike creations — perfectly crunchy vehicles for hot sauce or ketchup (both available). 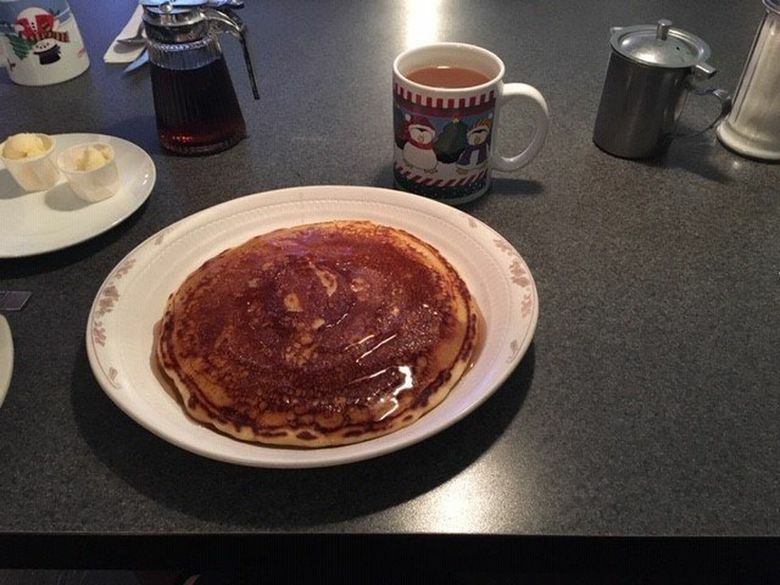 Pancakes ($7.99 with ham or sausage) are suitably face-sized, with a thick ‘n’ chewy texture that soaks up syrup nicely; you can really pour it on. If you want more protein with your meal, you can also order expected classics like steak and eggs ($10.99) or the ominously named “S.O.S. — Grandpa’s Favorite!” Like my actual grandpa’s favorite, “Grandpa’s Favorite!” is all about beef: hamburger gravy over toast ($6.99, $7.99 if you add on hash browns and an egg). Sound gross? You’re free to go somewhere else. But as for me, my morning at the Baranof was a pleasant little snapshot of the neighborhood I grew up in, as regulars and delivery personnel came in, one chatting with a cook about ferry schedules, and I soaked up all the rough-edged Old Seattle chatter I could. As the shovel men departed, I realized that one of them looked like no one so much as “Twin Peaks'” benignly grinning Pete Martell. I wondered about the portrait above my table, featuring three babies wearing name-tag sashes: Leland, Lyle and … Lando? It looked like the name was cut off. Landon? Does anyone know? Do you? Just before I left, leaving a large tip for my waitress and her enviable rhinestone snowflake shirt, a little kid ran through the diner area in Christmas-themed long johns, and I realized that this bar has been around since I was that kid’s age. But a Google search reveals that it’s even older than that. Most things in the neighborhood have changed since then, but this place, seemingly, hasn’t. Because amid a pricey brunch climate characterized by heirloom lettuce, politically correct goat cheese and top-shelf gin cocktails, the endangered dive bar brunch is a thing of beauty, a nexus of grungy and cozy that, when well-executed, is a public service. I am glad to have found it at the Baranof. This post was updated January 3 at 12:16 p.m. to clarify that while the Baranof opens at 6 a.m., breakfast service does not begin until 7 a.m. The Baranof, 8549 Greenwood Ave. N., Seattle; 6-2 a.m. daily; 206-782-9260, facebook.com/Thebaranof.